India's cultural cauldron of West Bengal combines the arts, the city, the countryside, mountains, and nature. Whether you're intellectually inclined and want to be among writers and wandering minstrels, or adventurous and want to roam with rhinoceroses, these diverse West Bengal tourist places offer it all. The West Bengal capital of Kolkata, officially known by its British name of Calcutta until 2001, has undergone a dramatic transformation over the last decade. No longer identified with slums, destitution, and the inspiring work of Mother Teresa, Kolkata has grown into the cultural capital of India. In addition, Kolkata is the only city in India to have a tram car network, which adds to its old-world charm. The Sunderbans, one of the top national parks in India, is a magnificent tangle of mangrove jungle that’s the only one of its kind in the world. It's spread over 102 islands (54 of which are inhabited) and extends into neighboring Bangladesh. The Sundarbans is only accessible by boat and exploring it this way is a unique experience that shouldn't be missed. Don’t be hopeful of seeing any tigers though. They're very shy and usually remain well hidden in the reserve. Darjeeling, famous for its lush tea gardens, is one of India's top 10 hill stations. It's blessed with a stunning view of Mount Kanchenjunga, the world's third highest peak. Some of Darjeeling's most popular attractions include monasteries, botanical gardens, a zoo, and the Darjeeling-Rangeet Valley Passenger Ropeway cable car (the longest cable car in Asia).﻿ Darjeeling is a wonderful place to walk around and explore the tea estates, villages, and markets. Seeing the mountain sunrise from nearby Tiger Hill has also become a popular thing to do. Don't visit during the monsoon season though -- the region is one of the wettest places in India! To get there, travel on the famous Darjeeling toy train. If you'd prefer to be away from the crowds, Kalimpong is a less-touristy alternative 2 to 3 hours from Darjeeling. The town sits on a ridge overlooking the Teesta River, which separates it from Sikkim. It was ruled by the Sikkimese until the early 1700s when it was taken over by the king of Bhutan. The British won it back in 1865. Attractions include Buddhist monasteries, adventure activities, trekking, and nature walks. There are plenty of hills and villages to explore in the vicinity. Mansarovar Homestay is a lovely, serene guest house with an organic garden and mountain views. 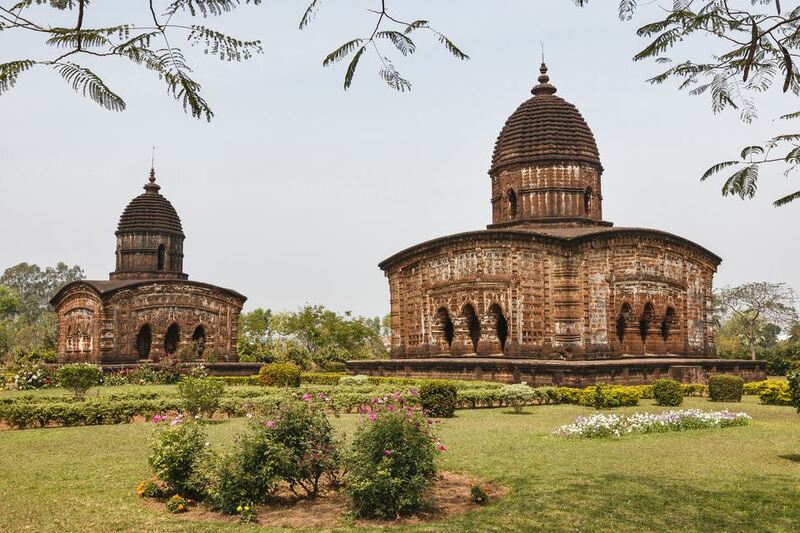 About 4 hours west of Kolkata, Bishnupur is renowned for its remarkable terracotta temples, terracotta pottery, and silk saris. The temples were built mostly during the 17th and 18th centuries by Malla dynasty rulers. During this time, there was a revival of Hinduism with devotion to Lord Krishna, after a prolonged period of Islamic dominance. The result was temple architecture that unusually blended Bengali-style curved roof with Islamic domes and arches, and Oriya-style duel (sanctum). The detailed carvings on the temples' terracotta tiles feature scenes from Lord Krishna's life, as well as the Hindu epics The Ramayana and Mahabharata. You'll find reproductions of the tiles sold everywhere. They say that the quaint university town of Shantiniketan (meaning Abode of Peace), 4 hours northwest of Kolkata, is better comprehended than seen. Noble Laureate poet Rabindranath Tagore founded a school there in 1901, which later developed into the Visva Bharati University with an emphasis on humanity's relationship with nature. One of the main attractions in Shantiniketan is the Uttarayan complex where Tagore lived. It now has a museum and art gallery. The Upasana Griha prayer hall also stands out because of its many-colored glass windows. Kala Bhavan is considered to be one of the best visual arts colleges in the world. It has wall paintings, sculptures, frescoes, and murals of famous artists. Shantiniketan is also a well regarded center for traditional handicrafts such as batik, pottery, weaving, and embroidery. Shop at Alcha boutique and Amar Kutir. The best time to visit is during one of the many festivals such as the three day Poush Mela (usually in late December), with its live Bengali folk music, and Holi (celebrated as Basanta Utsav). Alternatively, try to catch the Bondangar Haat (village market) that's held every Saturday. Wandering Baul singers are as much a feature at it as the handicrafts. If you can't make it all the way as far as Kazaringa National Park in Assam to see the rare one-horned rhinoceros in the wild, don't despair. Jaldapara National Park has about 50 of these creatures, and you can view them close up on an elephant safari. The sanctuary is the most well-known forest in the Dooars region, at the Himalayan foothills of West Bengal close to Bhutan. If you stay at the Forest Department's Hollong Tourist Lodge deep inside the national park, you'll be blessed with the sight of animals wandering to the nearby creek and salt lick -- rhinos included! It's possible to make reservations for the tourist lodge online. Otherwise, Mithun Das of Wild Planet Travels is the best person for all travel arrangements, including lodge bookings and safaris. The sanctuary is open from October through May. The top months for rhino watching are March and April when the new grass comes up. About 6 hours north of Kolkata, spread throughout Pandua and Gaur, are the fascinating ruins of the former capitals of Muslim nawabs (rulers) dating back to the 13th-16th centuries. Most of the ruins are mosques, including the 14th century Adina Masjid in Pandua. It's one of the largest mosques in India and it contains the tomb of its builder, Sikander Shah. Avoid overcrowded Digha Beach and head to Mandarmani Beach, about 3 hours south of Kolkata, instead. Although it's not far from Digha, this fishing village with a super long stretch of beach is so much more peaceful and unpolluted. Bombay Beach Resort and Sana Beach Resort are recommended places to stay there right on the beach.